How good a swimmer are you really? 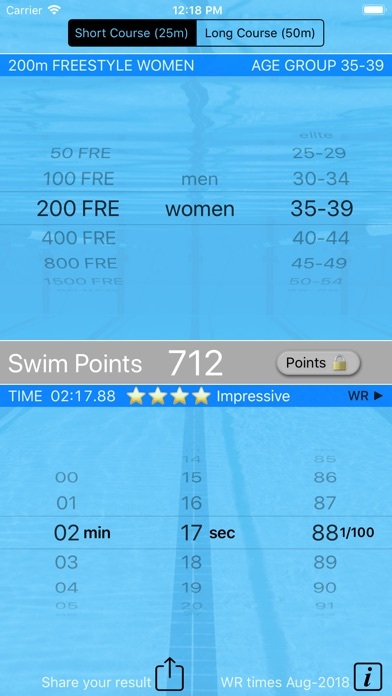 Designed by the swimmers for the swimmers, Swim Points provide the best way to evaluate, compare and share your swimming times. Rate and compare the results among different events, gender, even among the age groups! 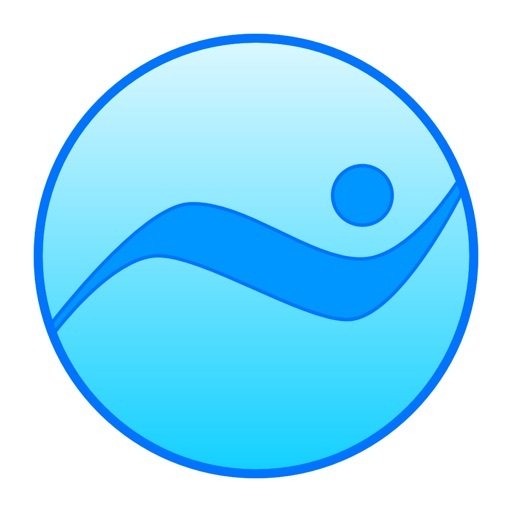 Swim Points is the essential swimming companion app. From just testing your fitness level, to chasing the best times in the world - stay motivated and improve your points. - "Having Elite and Masters scoring all in one app is key. The best age-group times are just phenomenal! It keeps you motivated." - "Now I can set much smarter goals - goals that are adjusted to my age!" - "Very easy and intuitive to use!" Pick an event, then roll to your time. Swim Points will calculate on-the-fly. 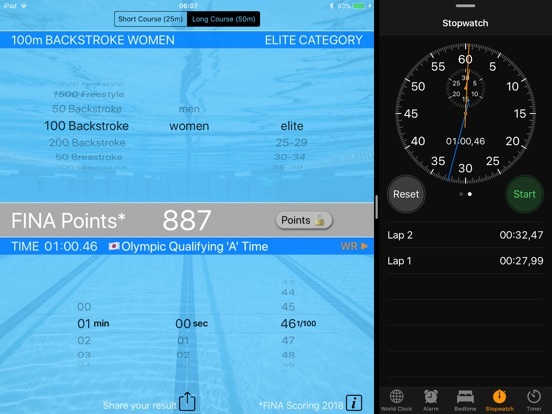 For Elite Category, they will match Fina Scoring tables. For the age-groups, Swim Points will use the same formula, but based on Masters World Record times. 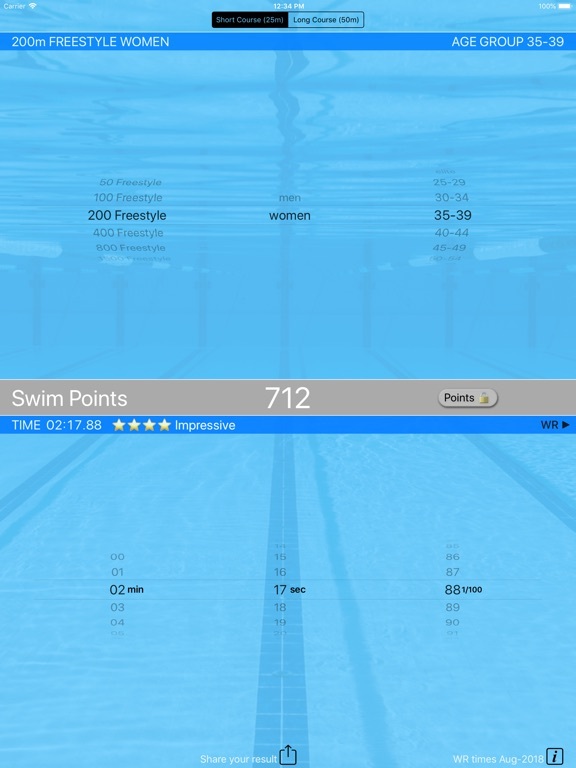 Lock the points to compare the swims among different events, gender, pool lengths and age groups. For any event or age group - roll the time towards 00:00 (min:sec) to get the points out of the maximum points range and the time will automatically “bounce” back to the World Record time. Alternatively, use the WR> shortcut to jump to the world record. Once you see a World Record time, hit Lock points. You can now pick any event and any age group, and glance through all the world records. That is because 1000 points always means a World Record performance. Swim Points Calculator uses the points tables (based on World Records) to convert your times into point values. More points for world class performances (WR time is 1000 points) and fewer points for slower performances. By assigning point values to swimming times, comparisons of results among different events are possible. For Elite category - active competitive swimmers - Swim Points exactly match the Fina Scoring Tables, as defined by Fina, the International Swimming Federation. For age groups, the Swim Points formula is the same, but based on Masters World Records! Swim Points Score is therefore a universal value. It allows you to analyse your performance and follow your evolution as a swimmer. It can also help you to objectively estimate your strongest and weakest stroke. Do not get discouraged by “lower” points you might score! The scoring formula is such that the points drop rapidly near the world record pace. Lacking just 10% behind the WR time, what would be an impressive swim, will correspond to just 750 points. 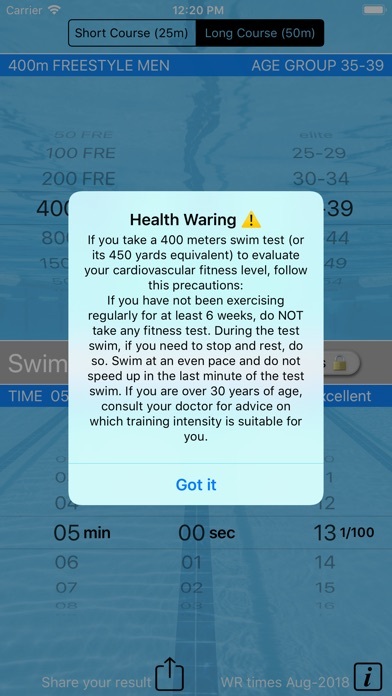 Moreover, some 200 points is also a good swim by any standards - a score that people who never regularly practiced swimming will hardly achieve. Swim on my friends, and remember: once a swimmer, always a swimmer! Just hit “Lock Points”. You can now change any selection in upper screen and the time will adjust to match the corresponding points. 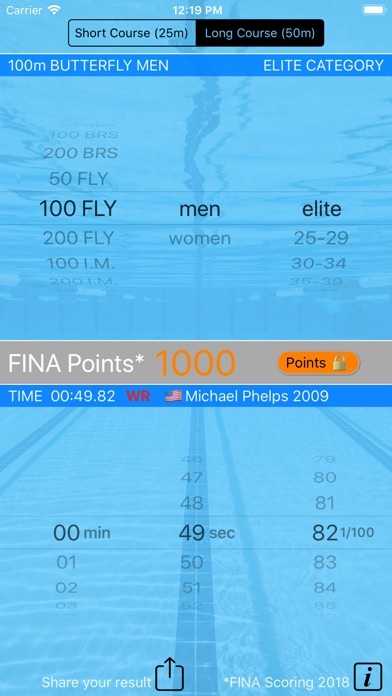 For example, set the event to 100 m breaststroke men, elite category, and the time to 1:05:84. It brings the points value 602. Now, we want to know what the long-course (50m pool) equivalent of this result would be. 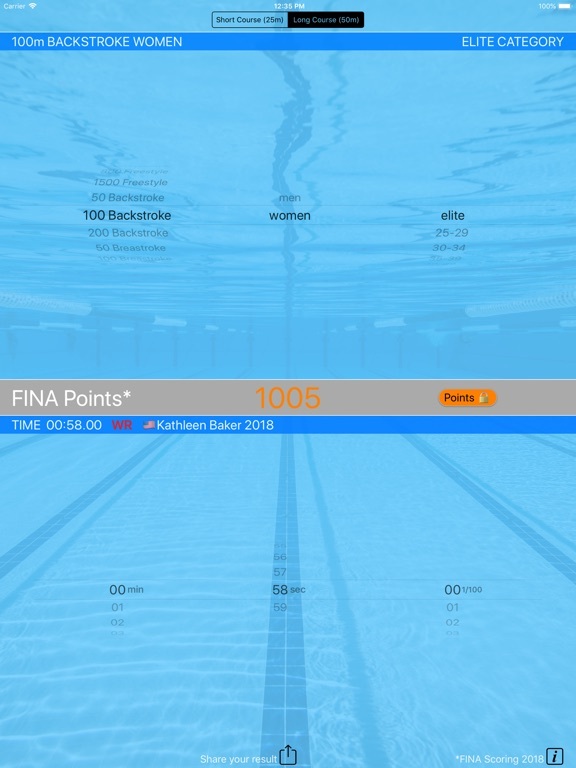 We lock the points, then select Long Course, and the time animates to 1:08:59. Done. Suppose a swimmer wants to know how many points would their time bear after she or he enters a higher age group. Or, for instance, we wish to see if our time is good enough for a world record in any of the higher age groups. Say that a swimmer now competes in the elite category and his personal best for the 50 m butterfly (Long Course) is 26.90s, which is quite good indeed. Do older guys swim faster? (You bet!) Just roll the age-group selector and find out that this time would be a WR time not sooner than in the age group 60-64! PLEASE NOTE: Tokyo Olympic Qualifying times are not yet FINA confirmed.